Theories abounded when David Merry began pouring sand and shells in a plot in the backyard of Cleaveland House, the home of Island author Cynthia Riggs, “There was all kinds of speculation — was it a bocce green, a tennis court, a place where I could burn brush, a garden, a memorial pet cemetery?” A writer of mysteries herself, Ms. Riggs no doubt relished the suspense. The public’s guesses were soon proved wrong when a 34-foot 1967 Egg Harbor pleasure yacht was trucked in to be berthed on the pad. Though the boat may seem out of place on land, Ms. Riggs is no stranger to the water. Before settling down in her ancestors’ home (eight generations of Riggs have lived in Cleaveland House) Ms. Riggs made her life on the water. She has been a private captain on yachts and barges, and has delivered boats all over the world, including doing an Atlantic crossing in a 34 foot O’Day sailboat with a mutinous crew of one. The Victorious is quite a sight. Perched on metal stanchions, her red white and blue hull arcs gracefully above sun-bleached clamshells. 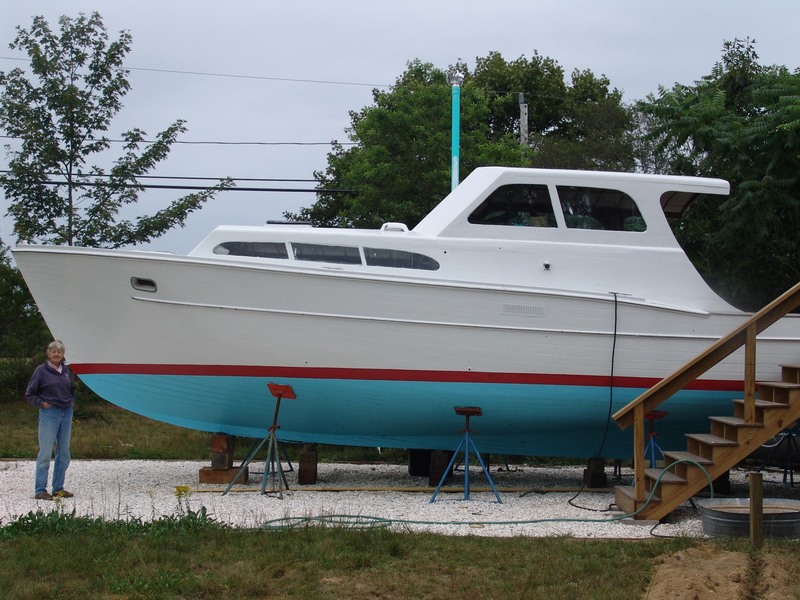 The boat is all wood, a rarity in these days of steel and fiberglass, and has the indolent bulk of luxury one does not always associate with fishing boats. “These Egg Harbors were the Cadillacs, no, the BMWs of boats,” she said, “Every little part has three, four, five uses,” she said, showing off how the cabin door opens, closes, converts to a screen for hot weather and can be sealed for a Northeaster. The boat has come a long way, both geographically and aesthetically, since its residence in Goose Bay. Ms. Riggs bought the boat in October, and Jocelyn Marine of New Bedford replaced the transom, then transported it to New Bedford. From there, Ralph Packer barged the Victorious to Vineyard Haven, then Phil Hale brought it to Cleaveland House on the Edgartown-West Tisbury Road. Repairs have ranged from removing the fly bridge for work and replacing rotten boards, to the reupholstering of the cabin settees. Contrary to some rumors, Ms. Riggs is not renting out the boat to lodgers, though someone may be setting up an office in it, as it is a nice space with a WiFi signal. Ms. Riggs expects her repairs to be done in a few years, but in a few months the Victorious should be ship-shape enough for a “lawnching” party. Later will come the heavy-duty installation of engines and a generator.